I was thrilled to finally make it to Orlando in one piece, and to not have to engage my backup plans of flying to Tampa and renting a car or having to come a day later. My HIMSS schedule this year is crazier than it’s ever been, with only a few scattered hours of free time. Missing all of Monday would have been a mess since I had several meetings with people I only see face-to-face at HIMSS. Fortunately, I connected with a colleague in Chicago that I hadn’t expected to see and we were able to spend a couple of minutes together doing some quality shoe-watching. ONC jumped on the “let’s release things at HIMSS” bandwagon by posting the Notice of Proposed Rule Making for Interoperability since we’ll all have time to read it this week. 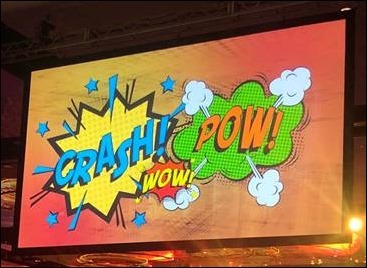 Those of us who are at HIMSS are running around crazy, and the ones we left on the home front are running around crazy covering the work we left them. Proposed requirements include the ability to export electronic information in a computable format for not only single patients, but for all patients in the event of a provider switching EHRs. They missed the mark, however, since they’re allowing vendors to determine the export standards they will use rather than making a proscribed standard. They also clarified seven exceptions to the information blocking provision. If anyone has the time to read it and finds other interesting nuggets, leave a comment or email me. I was glad to get out and pick up my registration materials in the morning before the sun began to beat down mercilessly. For those of us in frozen climates, being exposed to anything warmer than 50 degrees is likely to cause heat prostration. I met up with a good friend and planned our booth crawl strategy for tomorrow, so I hope all of you manning the booths have your game faces on. We’ll be watching for the best, worst, and most memorable booth teams. Despite the sun, I made the walk back to my hotel without melting, but opted to take the shuttle bus when I returned to the convention center for the opening reception. The reception was full of attendees donning superhero capes, some of them over their backpacks, which made for an interesting look. There were Spandex-clad entertainers dressed like Spiderman, Batman, and their masked colleagues. 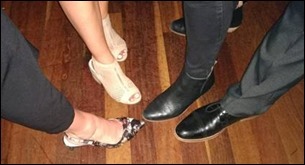 The room was pretty dark so it was difficult to take pictures without being totally obvious – I missed some great shoe pics for sure. The lobby outside the Valencia Ballroom had some faux food trucks serving as bars that looked like they had long lines – fortunately the lines inside were much shorter. HIMSS continues to not understand “cocktail reception food,” offering several items that required forks, making it difficult to figure out what to do with your drink. I also thought I saw someone eating something with chopsticks but was never able to find the buffet from which it came. The reception is a great time to connect with friends old and new before everyone splits up to various vendor events and company dinners. I try not to sign up for more events than I can actually attend. My usual wing-woman was off to the KLAS dinner, so I opted for one of the regional HIMSS chapter events, which ended up being a good choice as I met several new folks who had some great stories to share. My dinner partner was a vendor rep who covers several states including two served by the chapter, and I learned a fair amount about a certain niche in the medical equipment market. Key themes continue to include EHR optimization and workflow improvement. In talking to a few people at big health systems, I learned that there are quite a few organizations that aren’t anywhere near down the path to value based care as it might be assumed that they would be. In many areas there is still a lack of alignment between value-based contracting and physician incentives. It’s hard to get people to coordinate care and reduce utilization when they’re still being paid on a model that is largely based on production. I think those of us in the healthcare trenches assume everyone is trying to be on the cutting edge when in reality many groups are just trying to hang on. Since Mr. H doesn’t do the party circuit and Jenn isn’t here this year, I had to do my part for the team and whirl off to the next event. 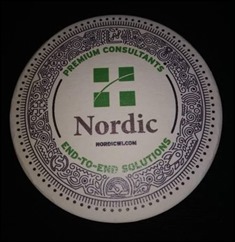 Nordic Consulting outdid itself as usual with its classy event at the Oceanaire Seafood Room. Just about every type of seafood was represented, along with a nice wine selection and a dessert bar that made a nice addition to the night. The room layout was conducive to conversation and I was able to recover from the loud volume yell-fest at my previous event. I’m always impressed by their staff, who print out badges and place them in reusable magnetic holders so you don’t wind up with sticky film on your clothes or holes from the pins given at some events. No wristbands, either. 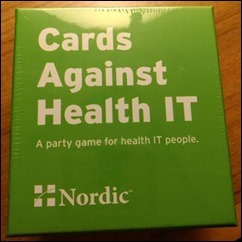 Upon returning your badge holder on the way out, you were presented with a Cards Against Health IT game, which I can’t wait to play. They assured me it is workplace appropriate, unlike the game that inspired it. I regularly attend a Halloween party with a number of local healthcare IT folks, so I know what I’ll be bringing this year along with my standard casserole full of hot artichoke dip. Lots of cool shoes at Nordic, reminding me of my wilder shoe days. I’ve needed cortisone shots after my last couple of trips to HIMSS, so I’ve dialed my footwear down quite a bit. I do have some sparkly numbers planned for tomorrow night and they’re comfy to boot. There were several other parties tonight. I heard the one hosted by sponsor Redox was hopping, but I was pretty worn out after battling travel last night and surviving the relative heat wave today. As I headed for my low-rent but walkable hotel, I met up with an attendee who was trying to figure out how to walk to a hotel adjacent to mine, so we had a nice chat on the way. It was nice to get to know a woman in the startup space and learn more about what she is trying to accomplish with using technology to fuel smoking cessation and positive behavior change. Also on tomorrow’s dance card is an opportunity to crash the new HIMSS member ice cream social. If that doesn’t work out, there are plenty of in-booth happy hours to offer distraction. I’ve got a long list of must-see booths and will be waiting with the crowds for the doors to open. Until then, I need some beauty sleep!